What happened to Linsey Hart? When the Cornell-bound teenager disappears into the steamy blue of a late-summer morning, her quiet neighborhood is left to pick apart the threads of their own lives and assumptions. 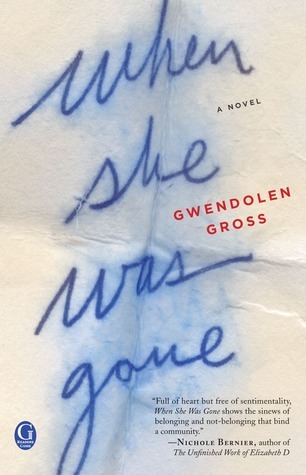 Gwendolen Gross is the author of five critically acclaimed novels, including The Orphan Sister and The Other Mother. She has worked with porcupines and kinkajous as a science demonstrator, on mountain tops as a naturalist, as an editor, opera singer, writing instructor, and mom. She lives in Northern New Jersey with her husband, daughter, and son. Linsey is scheduled to start at Cornell and right before her family is to drop her off, she vanishes. No one thought anything was wrong with her, except she just broke up with her boyfriend at her mother's insistence and there is no evidence of foul play. The last person to see her is the piano teacher, Mr. Leonard, who lives across the street. The story recount the next ten days while the small community searches for her. As her mother goes door to door searching for information, she learns more about her neighbors than she ever expected about her neighbors. The are certainly a lot of characters in this book and each has something to hide. Mr. Leonard, has cancer with just a few months to live, and has a few unspeakable habits that explains why he never married. Reeva, the lady one street over, is having an affair with a young man that is just a few years older than Linsey. Her younger twin brothers, Cody and Toby, who seem a bit glad that she is gone in a weird way. Geo, the eleven year old that lives behind Linsey, should have been the star of this story, and in a way he is. He is quirky and unique with a bit of baggage that would bother most boys his age but he takes it all in stride. Even though Linsey is the main character of this book, she is almost entirely absent from it except in the beginning and the end. I really adore Gross's unique style of writing and I enjoyed The Orphan Sister . I know quirky books like this don't appeal to everyone, but you should give this one a try. It is everything you ever expected in a small town but would never be able to learn on your own. i LOVE Gwendolen Gross - she is such a sweet person. I would absolutely LOVE to her latest book! Thanks for the chance to win. Bet this is a great read! Sounds like a great story. I would love to read it. This is a new author to me but I am going to check out her other work. Thanks for this chance. This book sounds great. I love suspense/thrillers. Thanks, Mary! Just happened to see this book on Goodreads, then saw your view when I went to the book's page, and your note that you were giving the book away! And lo and behold I squeezed in here a mere 1 hour before it's over :) serendipity!! This actually sounds like something I would normally pick up, although I hadn't heard of it before tonight. I must have missed reading my daily email from you on the day you posted this!